Pride of Nassau – This rendering of a revamped Prince George Wharf was shared in the cruise port redevelopment proposal submitted to the Government of the Bahamas by Global Ports Holding late last year. 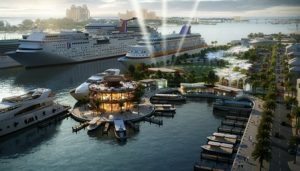 The design features a completely transformed port and welcome center, additional mega-berths to accommodate some of the largest cruise ships in the world, and a state-of-the-art entertainment pavilion to host local and international acts. The project start date is subject to customary negotiations with the Government of the Bahamas and regulatory approvals before an agreement is signed, which is expected to take 60 – 120 days. The $250 million winning proposal submitted by Global Ports Holding includes plans to transform Prince George Wharf into a state-of-the-art port and waterfront destination managed by Nassau Cruise Port Ltd. (NCP), a specialty purpose vehicle created for the project. Under the proposed ownership structure of NCP, Global Ports Holding will own 49 percent of the company, while another 49 percent will be owned by the Bahamas Investment Fund (BIF). BIF will be created to serve as an investment vehicle which will allow tens of thousands of Bahamians to become shareholders in the project. The final two percent will be used to establish the YES Foundation, a charitable fund that will support youth, education and sports programs. The plan also includes the development of a world-class entertainment venue, the formation of partnerships with local stakeholders and various forms of support to improve the state of the downtown core.